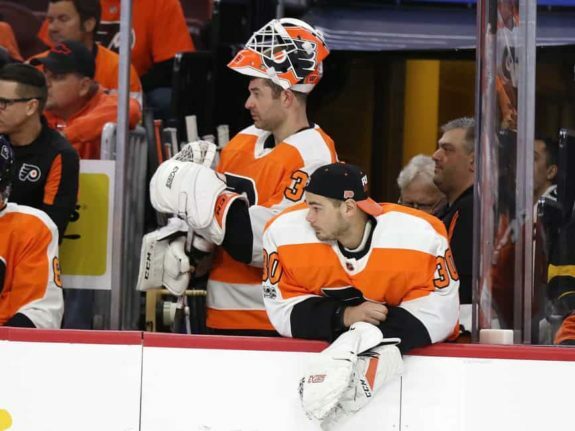 With the long-term injury to Philadelphia Flyers starting goalie Brian Elliott and then the injury to backup Michal Neuvirth, it was pretty obvious that the Flyers would have to make a move. The Flyers were left with rookie goalie Alex Lyon, who looked alright in his first couple of starts but had such a small sample in the NHL. While they could have chosen to just ride the season out with Lyon between the pipes to give him experience, general manager Ron Hextall chose to show faith in his team and go out to acquire a goalie with a few more games under his belt. The team has been through some rough spurts, including a 10-game losing streak in the beginning of the season, but lately they’ve looked much better. For the players, this was a big boost of confidence because Hextall proved to them that he believes in them. Searching for a goalie when your team just lost its two proven goalies is not an easy task, especially because every team knows that you’ll pay more due to desperation. Fortunately, Hextall was able to maneuver a trade with the Detroit Red Wings for Petr Mrazek which only cost the team two conditional draft picks. The trade that occurred on Feb. 20 included a conditional fourth-round pick in the 2018 NHL Entry Draft as well as a conditional third-round pick in the 2019 NHL Entry Draft. The Red Wings also retained half of Mrazek’s salary. Looking at this trade with the potential that Mrazek has as a 26 year-old goalie, one can very quickly say the Flyers got away with a steal. Although one of the picks can potentially turn into a second-rounder, the likelihood of that occurring is not very good, as a lot of things will have to go right. There were a few goalies that were expected to be in play at the trade deadline, including Mrazek, Robin Lehner, Cam Ward, and Antti Raanta. With the Flyers’ hands tied, one had to think that acquiring any one of these other goalies would have taken quite the package of prospects and draft picks. 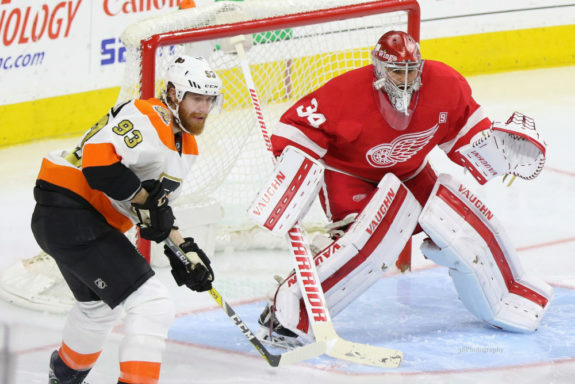 The Flyers and Red Wings were perfect trade partners in the sense that the Red Wings wanted Mrazek out as soon as possible and the Flyers were desperate for a goalie. 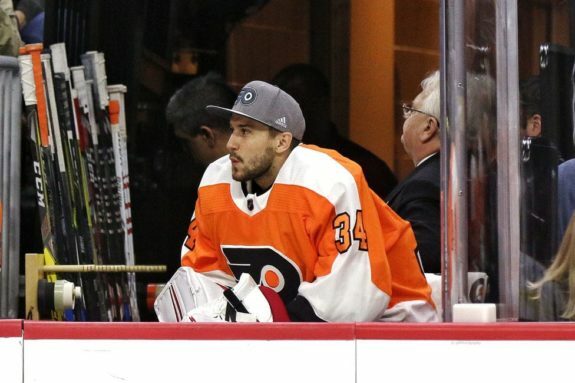 There were rumours prior to the Neuvirth injury that the Red Wings offered Mrazek up for a third-round pick, but Hextall turned the deal down. This rumour is hard to believe because when dealing with a team desperate for a goalie, the Red Wings only got one additional pick, and that was a fourth. Teams making a playoff run usually have their goaltending situation solidified by the trade deadline because otherwise they wouldn’t even be in contention. The Flyers’ situation was unique because not everyday do you have your two NHL goalies go down with injuries at the same time, unless you’re the first-year Vegas Golden Knights. Needless to say, if the Flyers make a run and Mrazek is able to backstop them to the playoffs then the Flyers made out like highway robbers. For any goalie, or player for that matter, your first game with your new team after a trade is a tough one. You want to be the best that you can be to prove that they made the right choice taking a gamble on you. Mrazek embraced that challenge and looked good Thursday night against the Columbus Blue Jackets. Things got off to a slow start with him only facing two shots in the first period. When you have all of the nerves of playing your first game with the new team you want to feel the puck. It’s difficult to settle in when you’re standing cold. Regardless, Mrazek was able to keep the first two out, which helped him gain a bit of confidence for the next two periods. Blue Jackets head coach John Tortorella must have sent a message during the intermission because the Blue Jackets came out firing and appeared to put everything on the net. They outshot the Flyers 14-6, and Artemi Panarin ultimately ended up scoring on a bad giveaway by Ivan Provorov. Panarin streamed down the wing and sniped on Mrazek blocker side. Mrazek really had no chance on the shot as it was perfectly located. After looking back on the play, Mrazek hadn’t clapped his stick on the ice to let his teammates know that Panarin was coming out of the penalty box which led to Provorov’s giveaway. While it can’t solely be blamed on him, it was a simple play that was missed. This could be attributed to nerves in his first game. In the third period, he was solid and turned away the only four shots that he faced. There were a few moments when the Flyers were hemmed in their own zone but he weathered the storm. He also showed some maturity late in the third when the Flyers were tired and he came out of his net to catch a shot that was going wide for a whistle. A shaky goalie may have left that puck to go in the corner, which could have led to a cycle for the Blue Jackets, but he came out confidently and stopped the play, allowing for a line change. Mrazek came out of the game with 20 saves and a win to continue the Flyers’ point streak. Overall, Mrazek looked very impressive in his first start as a Flyer. Despite the one goal allowed, he was lights-out and bailed the defense out on a number of occasions. He also brings a new element to the Flyers because he is confident coming out of the net to play the puck. There were a few miscommunications with the defense, but those things will sort themselves out with time. He had good positioning and rebound control for the most part and looked very confident. The only thing lacking style tonight was his mask. It looks like Mrazek is going to be the go-to guy for the foreseeable future for the Flyers, and if he can keep up this play, the Flyers will have a solid finish. If the Flyers get into the playoffs, who will play? Elliott or Mrazek?